Goshen College President Jim Brenneman signs the Bee Campus USA application as members of the GC Bee Campus USA Committee watch. They include, from left, Craig Johnson, Reena Ramos, Andy Ammons, Jeremy Corson and Glenn Gilbert. 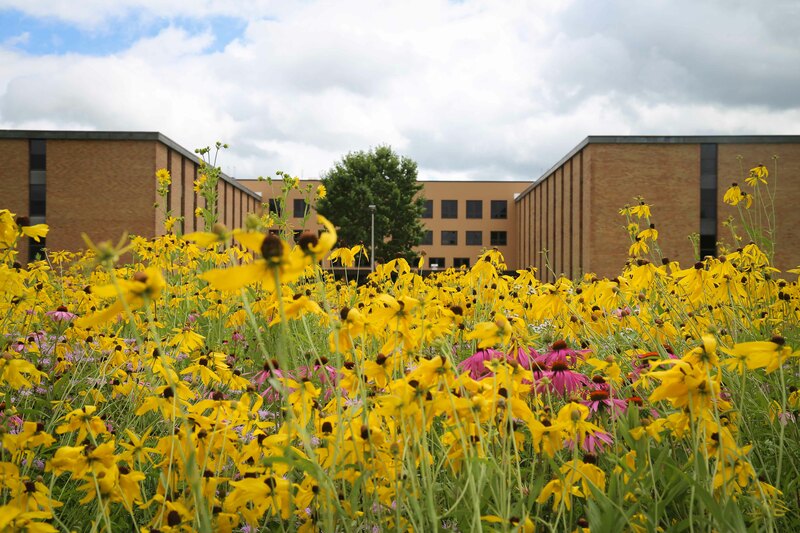 The Bee Campus USA title recognizes colleges and universities that commit to a set of practices that support pollinators, including bees, butterflies, birds, bats and thousands of other species. One of several native prairies on campus in full bloom. With 12 acres of restored prairie making up 20 percent of campus lawn and managed without the use of irrigation, pesticides or herbicides, the college provides a rich habitat with nectar and pollen for honeybees and other pollinators. 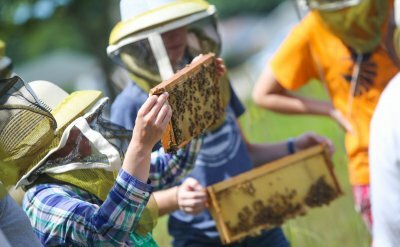 The college is also home to several beehives on campus and at its Merry Lea Environmental Learning Center. Andy Ammons, associate professor of biology, teaches a class titled “Pollinators in Peril,” in which students learn about the importance of pollinators to the environment and to humans who depend on them for food. 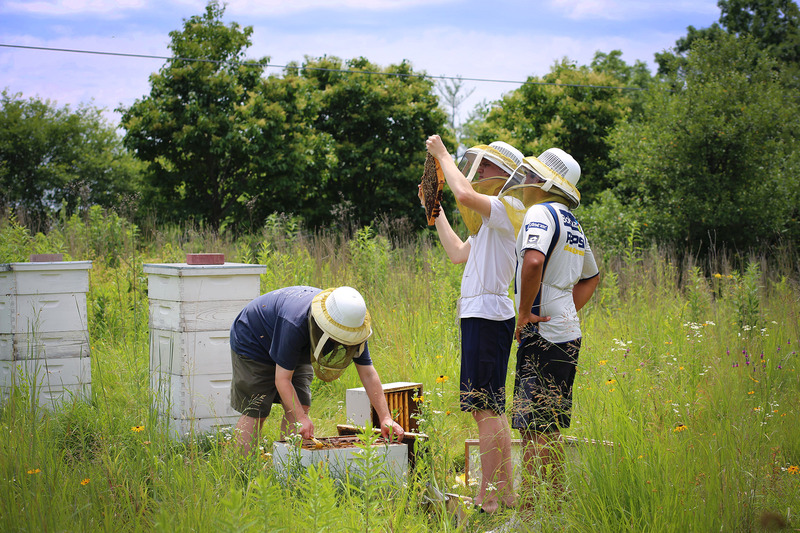 Students are directly engaged in the prairies and beehives on campus, as well as harvesting honey. Students work with Professor Andy Ammons (left) inspecting beehives on campus. As part of the Bee Campus USA application, Goshen College has organized a bee campus committee made up of students, faculty and staff who have expressed an interest in keeping GC pollinator friendly. 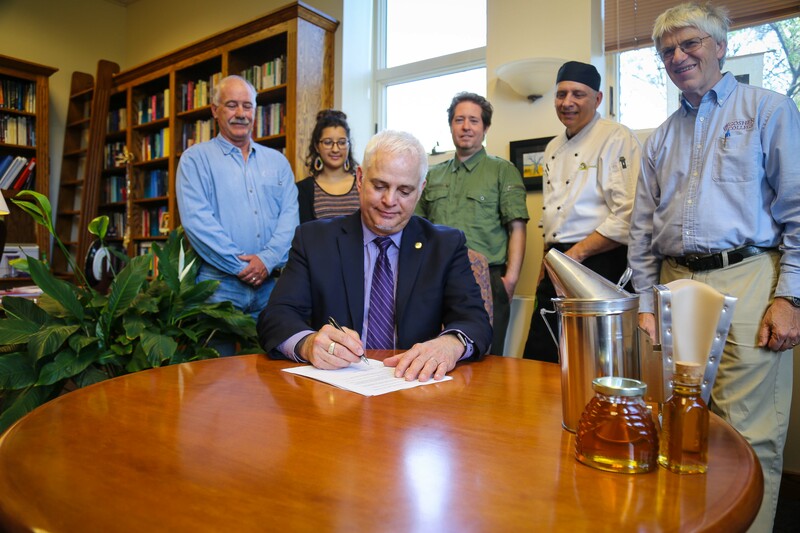 Students from the Bee Committee worked with AVI Fresh, the campus dining service, to create a Pollinator and Dandelion Day at the Westlawn Dining Hall on campus in April. Students collected dandelion leaves and flowers for the dining hall to be made into a pollinator salad and dandelion cookies. President Brenneman hopes that one day, the City of Goshen will be able to follow suit as the first Bee City USA in Indiana. “We’d love for the city to join this movement,” he said. Establish/maintain a Bee Campus USA Committee or Subcommittee. ​Host an annual campus event(s) to raise awareness of the importance of pollinators. Annually sponsor and track student service-learning projects to enhance pollinator habitats on-and off-campus. 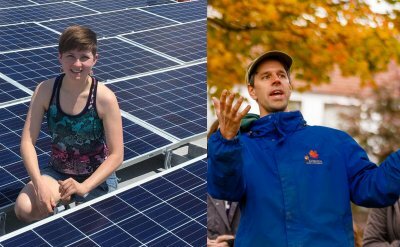 At least biennially offer a course and/or workshop on Pollinator Ecology and/or Integrated Pest Management and/or Landscaping for Pollinators. Post signage regarding pollinators to educate the campus and broader community about pollinator-friendly landscaping principles. Maintain a Bee Campus webpage on the institution’s website. Annually apply for renewal of the institution’s designation. Bee City USA® urges municipalities, individuals, organizations, corporations, and communities to promote and establish pollinator–friendly landscapes that are free of pesticides. Since its inception in Asheville, North Carolina in 2012, five more cities and been certified and about fifty more are in the process of preparing applications. 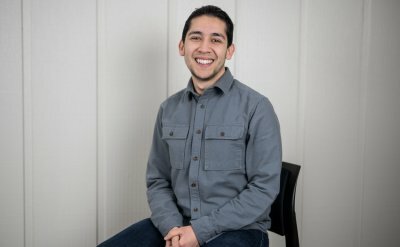 For more information about the application process for becoming a Bee City USA community, visit beecityusa.org.